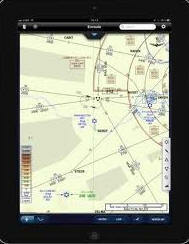 October 12, 2011 - Jeppesen announces that charter operator Corporate Flight Management has received authorization from the Federal Aviation Administration (FAA) to use the recently introduced Jeppesen Mobile FliteDeck app for iPad as an alternative to paper aeronautical charts. The authorization allows Corporate Flight Management to begin a systematic transition from paper to iPad with Jeppesen Mobile FliteDeck as the sole reference for electronic enroute and terminal charts in all phases of flight. ?The FAA authorization of Jeppesen Mobile FliteDeck on iPad for Corporate Flight Management follows on the success of a similar process for our earlier product, Jeppesen Mobile TC, and sets a positive precedent for other operators who are seeking to deploy mobile EFB solutions,? said Tim Huegel, director, Jeppesen Aviation Portfolio Management. ?We are pleased to collaborate with Corporate Flight Management to implement our mobile solutions that enhance situational awareness, reduce pilot workload and improve efficiency for pilots and operations staff.? The iPad with Jeppesen Mobile FliteDeck was tested as an operating electronic flight bag (EFB) with paper material backup during the probationary period conducted with an FAA Principal Operations Inspector. Corporate Flight Management also expanded on the EFB requirements outlined in FAA Advisory Circular 120-76A by developing crew familiarization procedures for safety and compliance, using iPad. The authorized EFB configuration is a Class 1 portable, kneeboard EFB solution that is secured and viewable during critical phases of flight as defined in FAA Order 8900.1. ?The authorization process to include Jeppesen Mobile FliteDeck on iPad as an EFB has been very positive among our pilots. It is very convenient to have a replacement for paper charts that includes enroute and terminal charts as well as Jeppesen Airway Manual text on a highly interactive and robust platform. This adds an extra level of situational awareness to all flight operations, due to its ability to display charts quickly and efficiently,? said Troy Denson, assistant chief pilot, Corporate Flight Management. Jeppesen Mobile FliteDeck features true, data-driven and interactive digital enroute navigation information and worldwide geo-referenced terminal charts. Jeppesen Mobile FliteDeck streamlines flight preparation, simplifies complex processes, eliminates labor associated with paper revisions and reduces clutter in the cockpit. Pilots are able to choose what information is displayed, including high or low altitude IFR charts, airports, airways, waypoints, navaids, airspace, terrain information, enroute and terminal communications and operational notes. The design allows for individualized on-screen presentation, while always remaining simple to use.